Frisian Islands, group of islands, northwestern Europe, in the North Sea, off the coasts of the Netherlands and Germany, and extending north from the mouth of the Elbe River along the Jutland Peninsula to Denmark. The group comprises the West, East, and North Frisian Islands. The islands are low-lying and are separated from the mainland by shallows. They mark the outer edge of the former continental coastline. Dikes and artificial embankments have been erected to protect the islands against incursions of the sea. Despite these efforts, parts of the Frisian Islands are slowly disappearing because of the constant marine erosion. The chief occupations of the Frisians are fishing, raising sheep and cattle, and farming (mainly potatoes). Summer resort activity is important on many of the islands. The East Frisian Islands belong to Germany and include Borkum, Baltrum, Langeoog, Norderney, Spiekeroog, Memmert, Juist, and Wangerooge. 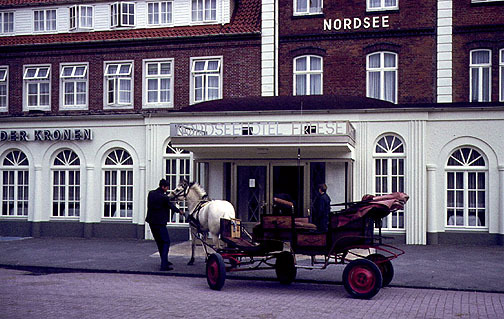 The North Frisian Islands, with the exception of the Danish islands of Fanø and Rømø, also belong to Germany. The group includes Sylt, Nordstrand, Pellworm, Föhr, and Helgoland, as well as Fanø and Rømø. Helgoland (English Heligoland), island, northwestern Germany, in the North Frisian Islands, in the North Sea. Mainly a rock formed of red sandstone, it is known as the Oberland. Steep cliffs surround the Oberland on all sides. A narrow spit of sand, called the Unterland, forms the southeastern portion of the island. 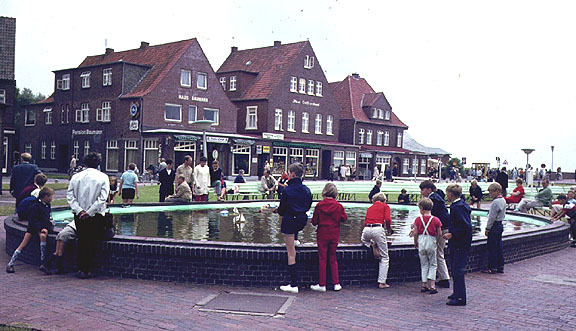 The major portion of the island community, a fishing and resort village, is on the Oberland. Helgoland has an area of about 160 hectares (about 395 acres). Helgoland belonged to Holstein, 1402-1714, then to Denmark until 1807, when it was seized by Britain, to which it was formally ceded in 1814. Britain transferred the island to Germany in 1890 in return for Zanzibar and other areas of Africa. Before World War I, the German government established a comprehensive system of fortifications on the island, including gun emplacements and submarine pens. Following the war the fortifications were demolished, under terms of the Treaty of Versailles. The island was subsequently refortified by the Nazi government and served as a major German submarine base during World War II. In 1947, during postwar occupation, the British navy blew up the fortifications and part of the island. Helgoland was included in the state of Schleswig-Holstein in 1952. Population (1991 estimate) 1747.